I deeply enjoy this hobby because it has brought so many good things into my life. Model railroading has taught me patience, given me an appreciation and respect for fine craftsmanship and helped me develop persistence to achieve long term objectives. Not bad for a hobby. Most everyone agrees the hobby is changing. Hardly anyone agrees on how it is changing or where it will wind up. Many obsess over the graying of the hobby and its implications, while others feel it’s gotten too serious or too shallow. Model railroading is indeed at a crossroads, one of many throughout its long history. For some reason this time it feels different to people. 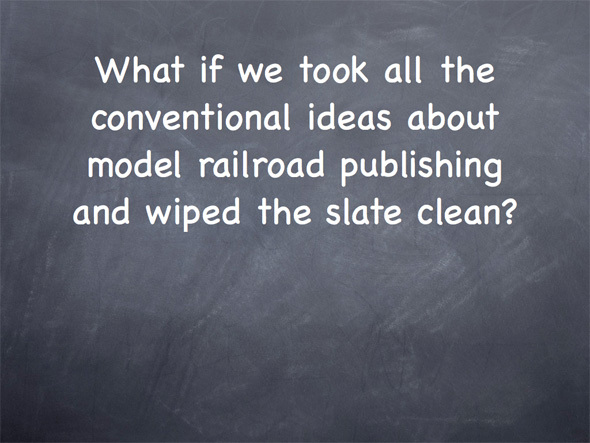 Modelers are candidly asking serious questions about whether model railroading has a future. I don’t know the answer but if the practice of model railroading is to go forward, we need to have smarter conversations than the ones we’re used to and we need them now more than ever. It’s my view that things have become institutionalized and do you share my sense that a lot of heads are buried in the sand? Everything is rosy, the future is bright and things are just dandy in model train land. Do you also sense that there is a growing disconnect between what we see promoted as normal in the magazines and the reality you and I have to deal with? I don’t know about you, but I have a life beyond the basement and model trains. I want railroad modeling to be one enjoyable part of my life, not take it over completely. Don’t misunderstand, they serve the important role of introducing people to general concepts. However, because of the need to appeal to the mass market, the general quality of the content doesn’t offer many challenges for advanced modelers anymore. Do we really need another article that holds up painted flex track or cotton puffball trees as the ultimate in realism? Yes, beginners need to learn these things but as experienced modelers, where do we go to find thoughtful, challenging material for our interests and skill level? Who is willing to speak to us? I genuinely miss Mainline Modeler don’t you? I miss the in-depth articles and I miss the premise that a reader could understand difficult concepts if they were presented intelligently. I miss the focus and respect shown for craftsmanship. Mainline Modeler did many of these things and did them well. The general interest mags? No longer geared to modelers like you and I at all. If the silence we’re experiencing from them isn’t enough, a recent mainstream editorial took the stance that we skilled and experienced modelers who enjoy a more serious approach to our hobby are ruining the so-called “fun” of it for everyone else. We’ve supposedly created an atmosphere that’s too intimidating for the average modeler. Okay, everybody is entitled to their opinion but to openly pit one segment of modelers against another? What possible good is going to come from that mindset? When did personal pride and a concern for craft and accuracy become forbidden? What about us, aren’t we having fun too? Apparently not and anyway, who gets to write the definition of what fun in this hobby is, a magazine or you and I? Let me say it again as clearly as I know how: The general interest magazines serve an important function for introducing people to model railroading. My argument against them is this: By shunning advanced work and concepts as too intimidating for “average” modelers, they establish a plateau in the minds of their readers for what the hobby can be. A plateau that shuts the door to the amazing depths this hobby has. If you think you’ve done it all and there’s no where else to go, your interest level dies and you move on to something different. When the challenge is gone from an activity, the people soon follow. Yes, Mainline Modeler was good, so was Narrow Gauge and Short Line Gazette in the “olden days”. Even Model Railroader. The times have changed to RTR and laser kits allowing one to build bigger. Considering the fact that MR will only print contest quality photos of layouts, regardless of size, motivation to excellence is hardly missing. What is missing is the fun. As an example I recall “50,000 Spikes”. I loved that series because it documented the trials and tribulations of 2 average guys (or so it seemed). They had fun, made mistakes, drank beer, and didn’t prepare the basement to museum quality standards before they pounded a nail. They just had FUN. We’ve spent so much time helping people avoid mistakes that we’ve become like the government, protecting us from ourselves. After 20 or 30 years there’s no pleasure in making beginner’s mistakes, but dang, don’t rob new people to the hobby of the only way we humans learn anything; trial and error. The how-to part has been moved to the internet where you can find instructions on any subject with the click of a mouse. Print magazines are in their death throws, and digital magazines can be produced so cheaply that in a little while, exactly what you are looking for will appear. I’d also like to suggest that the business of magazine publishing will likely continue to shrink until web designers take it over completely. What is fun? Is there a monolithic, one size fits all answer? I don’t think so, which is exactly my point. Fun in this hobby comes in many flavors and degrees of complexity. What I don’t understand is why people have to have such narrow definitions? Who is robbing people of the process of trial and error? If you read my post again, I state more than once that magazines like MR and RMC among others serve an important role in the hobby, that of introducing people to general concepts and techniques. I’m a firm believer in the process of trial and error for learning. I go through that very process every time I sit down at the work bench. Yes it will. On Aug 1. Print publishing isn’t going to go away. People have been predicting this for years along with the idea of paperless office from the 1980-’90s. It hasn’t happened yet, nor is it likely to ever happen. It is very true that much content has moved to the web, a trend that will continue. However, across the board, print magazines are actually flourishing in many ways. Appreciate your comments as always Ed.